Pension Tara in the Adrspach-Teplice rocks. 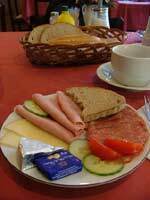 I stayed at Pension Tara on the strength of a friend’s recommendation and because of it’s location a short walk away from the entrance to the Teplice rocks. There are pensions right beside the entrance, but by staying a little further away, I hopped to avoid any traffic and pub-closing time hubbub. 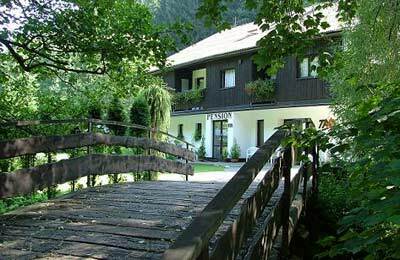 The pension actually turned out not to be as quiet as it’s location across a wooden bridge beside a bubbling brook might suggest, because the road is the main one linking Teplice to Adršpach and cars whiz along it from early morning until well past the bed time of an exhausted hiker. Still, it’s hard to imagine that it would have been any better right at the park entrance or within the towns of either Teplice or Adršpach. So how about the pension itself? Well it was fine without being anything outstanding. 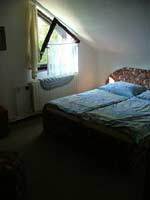 I had a room to myself for 470Kč per night with breakfast included. The bed was actually a fold-out sofa, which wasn’t terribly comfortable, but everything including the attached bathroom for my own private use, was spotlessly clean. The room was up under the roof so the only window was a skylight which looked out towards the road. Perhaps if you’re sensitive to noise it would be worth asking for room that faces towards the hill and the much quieter lane to the rear of the pension. There was nothing special about the décor, and in fact the printed bed linen is among the worst early 90’s fabric design that you’ll ever see. For the price though, everything was functional and clean, the reception area and breakfast room were quite pleasant and the garden stretching down to the stream was lovely. The pension appears to be a family concern and the staff are quite pleasant. The lady is brief, bordering on curt, but the gentleman is quite friendly and can offer firsthand advice about some of the less obvious attractions of the park. Check in was quick and efficient, partly because the lady just handed me the form and a pen to fill in my own passport details. Even if it was evident that she’d answered the same questions a hundred times before, she was willing to answer questions about the park and advise on the best way to approach a visit. There were also maps and guidebooks on hand for sale. I’d be happy to stay at Pension Tara again, but at the same time, with several places similarly priced and just as well located, I’d be equally content to give one of the others a try.